Whimsical wallpaper. Simes Studio hand-stenciled floors in keeping with their Wiener Werkstätte roots. Imaginative art covering every surface; equally impressive as it is unpredictable. Gleaming lacquered walls. And even a private dwelling for a beloved pair of Lagotto Romagnolos hidden under a stairwell, seemingly straight out of the pages of Harry Potter. This Glencoe home is nothing short of singular. “Every room has some kind of whimsy to it,” shares designer Denise Antonucci, Principal, ASI Interiors Inc., who first collaborated with the homeowners on a more contemporary home on the lake in Wilmette (very “Holly Hunt and Christian Liaigre”), joined forces once again when the couple purchased this English Cotswold style property built in 1912 nearly three years ago. Art features predominantly in the project, a natural extension of the homeowners’ passion and Antonucci’s background (she studied at the Art Institute). The result is an expansive collection that combines Andy Warhol with 19th century, modern French painters with the top Israeli artists. Working with Antonucci, they acquired 20 new pieces for their Glencoe space. Animals figure heavily, with little faces, furry bodies, and paws represented with mischievous artistry. 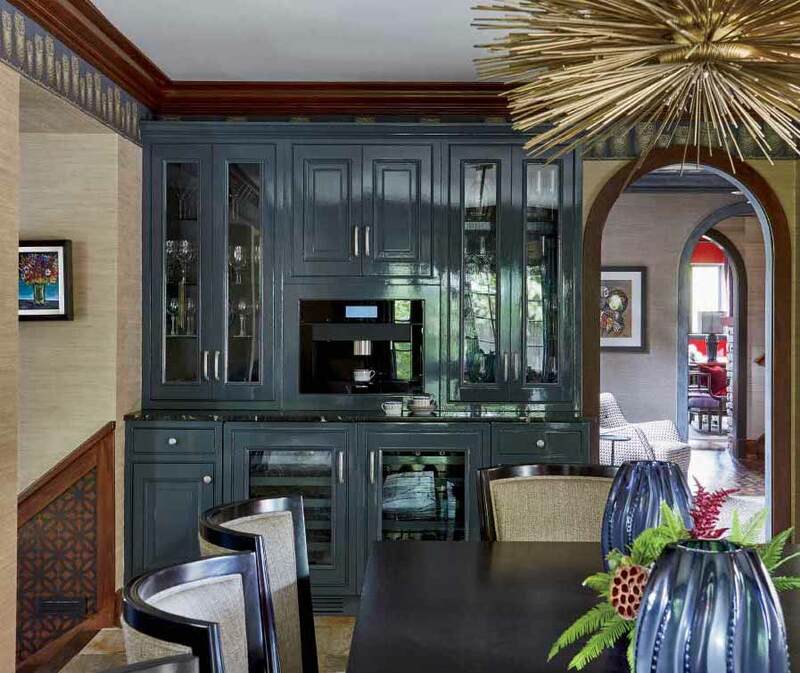 Forged iron frogs hold their ground indoors and ceramic roosters add color to the kitchen. 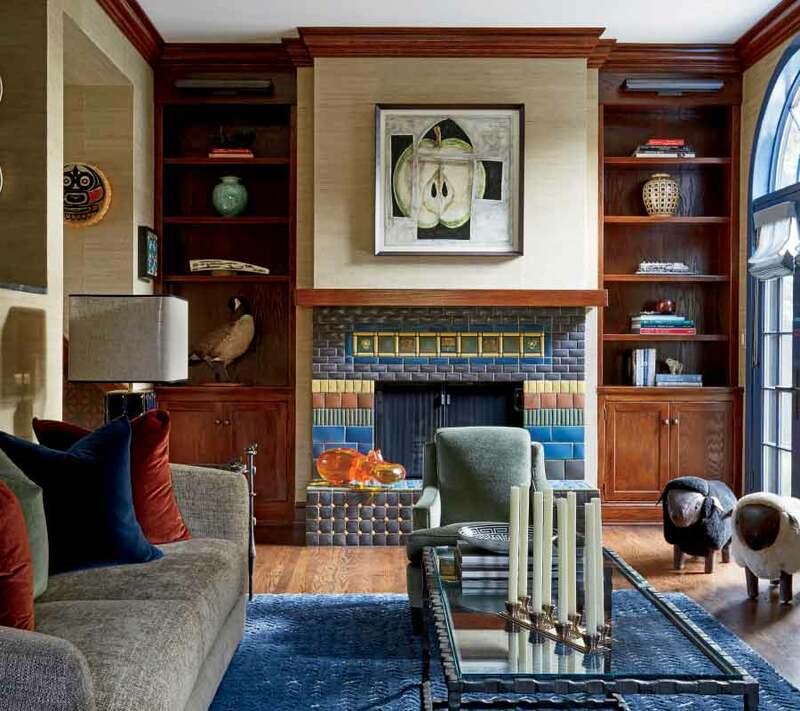 Bunnies climb playfully up a guest sitting room wall while a custom Frédérique Morrel needlepoint deer head watches over the living room, and a nearby larger-than-life rabbit sculpture. A rhinoceros, rendered in orange glass, rests by a colorful glazed ceramic tile fireplace (also accented by decorative fauna), with leather and shearling lambs just steps away. “In this project, I loved taking objects out of context and putting them in unexpected settings. I love to stop people in their tracks,” Antonucci reveals. 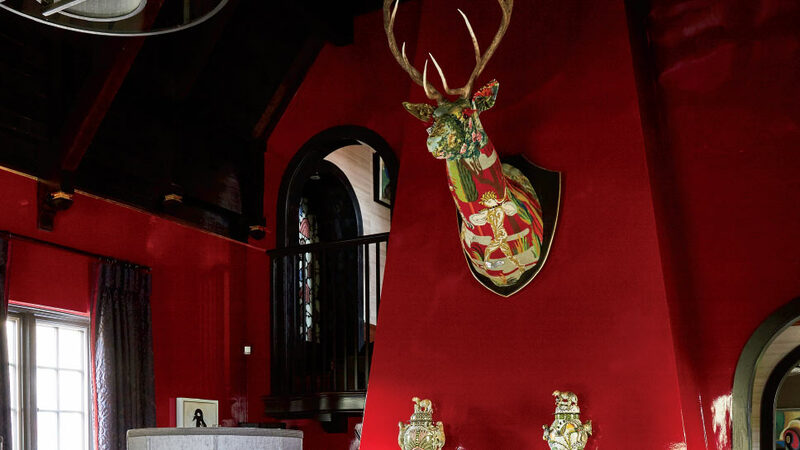 Other playful details that seem to bring nature inside include a newel post carefully carved in the shape of an owl, a dining room light fixture that looks like a porcupine, and a stained glass window festooned with the wisest of owls. Organic is a word that figures, too, in the feel of the environment. From Phillip Jeffries natural wall coverings—think grasscloth in cool neutrals—to warm wood floors, paneling, and detailing, nature sets the tone of the space. Handwoven rugs add additional warmth and softness, along with window treatments fabricated by Interior Dynamics. Texture also abounds in the stone and tile throughout the house, be it the rough-hewn style of the living room fireplace or the smooth and shiny surfaces of the bathrooms—or even the juxtaposition of both. To learn more about ASI Interiors, Inc., visit asiinteriors.com.